Editor’s note: The following is the second in a series of stories about Olympians. Following athletic pursuits, you can achieve greatness in a short span of time, but the academic pursuits will set you up for life. As a young Guyanese girl growing up in New York City from the age of 14, Aliann Pompey, had no idea that her undiscovered talent would lead her to four consecutive summer Olympics, beginning in Sydney and ending in London. Medalling in two commonwealth games, gold in 2002 and silver in 2010, and competing at World Championships, are just some of many achievements Aliann has attained over the years; her accolades mounting her as Guyana’s most prolific female athlete. Despite years running the 400m event, Aliann’s stomach still shrinks on competition day, allowing room for just a cup of hot tea and a slice of bread before a morning competition and twice the occurrence for evening competitions. A routine that is simple but critical for each athlete to be mentally and physically ready to run a race you have spent the remainder of the year preparing for. Each ritual Is different for every athlete and for Aliann, she executes five steps when facing an evening race on competition day. Wake up early, eat, stretch, hydrate and then go back to sleep. 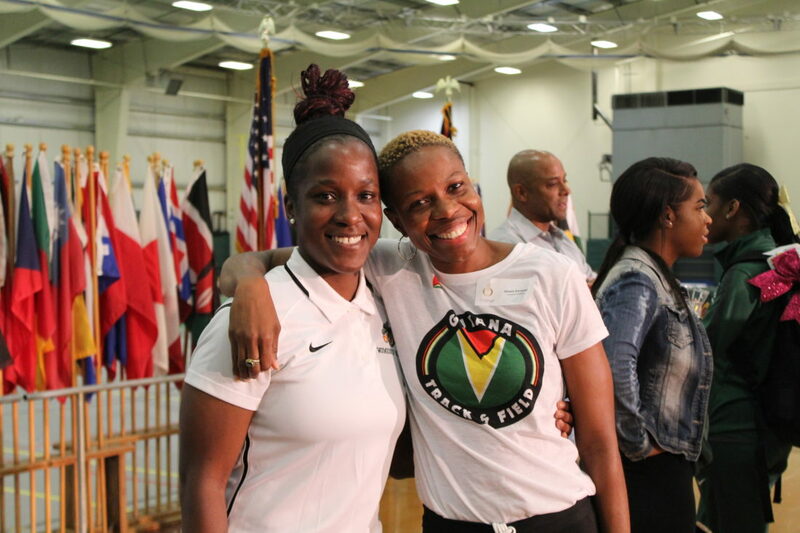 Once Aliann finished college and was ranked as 12th in the world, she began to attract the interest of two national Olympic teams, the United States and Guyana. The decision was an obvious one for Aliann, an idea she was sold on by a Guyanese coach. “Representing USA, I would be one of many, USA already had a legacy, but I would be making a much bigger difference competing for Guyana,” Pompey said. The South American nation of Guyana as well as her family and loved ones have always expressed gratitude, support and love for Aliann. However, the nation was oblivious to the physical and mental battles, Aliann fought every year, deciding to quit after each season, yet returning to preseason year after year because her love and passion for the sport always won the battle. In the world of athletics, you are bound to face new challenges as you embark in new territory. In 2012, Aliann qualified for the London Olympics and got through the first round, but not in her usual comfortable fashion. She had spent most of the season struggling; injuries were becoming more prevalent than ever, recovery time taking twice as long as she was used to; all of which taking its toll on her body and mind. Aliann took her final career steps on her way to a local English bar after leaving her belongings in the warmup area of the track. As she turned her back to her possessions, she didn’t dare look back. This time it just felt right, it was time for her. With feelings of contentment and satisfaction, she knew she had done it all and there wasn’t anything else left for her to do as a track and field athlete. All work and no play? That is not the case for Aliann Pompey. A joyous journey that marks out two sides of a road for on and off the track will forever be memories and emotions she treasures. From the countless conversations from meeting new people to the cultural events scattered throughout the day in the streets of Beijing. From the weight-gain of tasty lamb to the bewilderment of the amount of people and deafening noise that greeted her in the city of Sydney, leaving her frozen in her steps. From capturing scenic views through the lens of a camera and educating herself on the city’s cultures, are all memories wrapped up neatly in a bow for her safeguard. “One thing I didn’t take for granted was, I may not ever be able to come back, I don’t know how long it will last, so I don’t want to pass up the opportunity of experiencing those places,” Pompey said. Aliann remains heavily active and involved in the sport she loves. In the last three years, Aliann has always had an idea to create an international track competition known as The Aliann Pompey Invitational, however putting the plan into motion was harder than she thought. Underestimating the work needed to be done and the time to implement plans would’ve stalled anyone’s actions and risen doubt, but Aliann persevered to the end just as she persevered in her athletic career even when injuries and doping allegations against her opponents cost her higher rankings in her races. Perseverance, hard work and being honest with oneself are all traits Aliann has exhibited from a young age. Since its inception three years ago, The Aliann Pompey invitational has featured world-class athletes and nurtured local talent who have also gone on to represent Guyana in major events. Aliann and her colleagues have witnessed an improvement in the level of athletes that they have produced internationally especially from their homebase. Success stories range from world championships silver medallist and commonwealth champion at the junior level. With a competition such as this, aspiring athletes do not have to dwell on the what-ifs and the cost-issue of travelling afar to experience high level competition. The Aliann Invitational, the only one of its kind, provides that for homegrown athletes and the showing experience for Guyanese fans right at their doorstep. The last meet to take place featured Olympic and World Champion, Kirani James of Grenada. “It doesn’t get more competitive than that,” she said. Consequently, with the addition of the Aliann Pompey Invitational, it certainly has helped change the dynamics and the face of the sport in Guyana and provide a backbone for further success in the future. The next rising star may just also have the great honor of being the flag bearer for Guyana in a major event like Aliann experienced on more than one occasion. What can we expect from Aliann Pompey moving forward? She guarantees to be at the 2028 Olympics in Los Angeles in some capacity, whether in an official capacity or a spectator, the run of attending the last five Olympics will not end come 2028. There were never any mottos or mantras that Aliann practiced or rehearsed in her competing years, but there is one she loves to share, that become very clear to her towards the end of her career: “Sports is a metaphor for life, everything that happens in the field of play, plays out in real life in terms of how you deal with situations and the kind of effort you put into each attempt”.